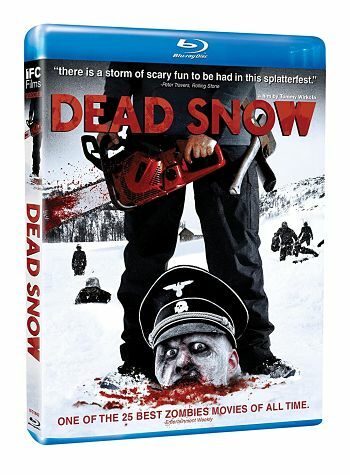 Dead Snow is a Norwegian horror movie about eight medical students who decide to spend their Easter break in a remote wooden cabin up in the mountains, where there is lots of snow and plenty of Nazi zombies. The students don’t know about the zombies of course. By the time they find out, some of the snow is red and they are pretty much screwed. Their cars are parked several miles away and the only guy who knows the way back has hopped on a snowmobile and gone off in search of his missing girlfriend. When the students first arrive everything seems fine. They have a nice warm cabin, some nice cold beer hidden under the floor, and the boy/girl situation is an equal mix, so nobody needs to play the gooseberry. They get the first hint that things are not quite right later that night when Liv (Evy Kasseth Røsten) goes to the toilet, which is located in a little wooden hut a few yards away from the cabin. Liv gets there okay, does what she needs to do, and has just pulled up her pants when she hears a noise outside. She peers out through one of the many gaps between the wooden slats and shouts, ‘Hallo!” Nobody answers her, but when Liv leaves the hut she sees a figure moving in the darkness. Liv runs back to the cabin and tells her friends there is someone outside, but they are not convinced and tell her it’s probably just a moose. Then a stranger appears at the door. He’s not a zombie—that’s always good news—but he is a pretty strange bloke and, after he has invited himself inside and insulted their coffee, the stranger warns the students that the mountains are not a safe place. He then proceeds to give them a short and nasty history lesson. During the Second World War, the area was a vital link between Russia and England and there was significant Nazi presence. The Nazis were very brutal towards the local population and beating and torture was an everyday occurrence. The Nazis also plundered people’s homes and stole all the gold and silver they could find. Eventually, they pushed the people too far. The local population numbered 3, 000 and they armed themselves with scythes, axes, knives, spades and anything else that they could find. The 300 Nazi soldiers didn’t stand a chance, but their leader, Colonel Herzog (Ørjan Gamst), ran off into the mountains with some of his men. It was presumed that the Nazis had frozen to death, but their bodies were never found. The stranger’s story is a real party stopper and he concludes his tale by warning his hosts to tread gently in the mountains. If they do not they risk awakening the evil presence that remains there. The students try to make light of the story and their visitor leaves, but it is not long before they find the proof of his words outside their cabin and it seems likely that there will be a few empty seats in the study hall next term. Zombies are bad news at the best of times. Nazi Zombies are even worse and these ugly mothers seem to have an unhealthy obsession with disemboweling their victims, just to see who has the most guts. Nasty! 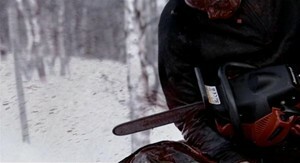 Dead Snow does have a few lighter moments and it is quite funny in places, but it is not a film for the faint hearted or anybody who is in the middle of eating a meal. In one scene, for example, a zombie pushes its fingers through one of the student’s eyeballs, takes a good grip, pulls the skull apart, and spills the brains onto the floor. Another scene shows one of the students being bitten by a zombie. He is so scared of joining the ranks of the living dead that he amputates his arm with a chainsaw. It a pretty messy procedure. Dead Snow tries quite hard to be a black comedy but, in my opinion, it never quite makes it because it is just a little too dark and gory. It is a good movie though, and if you like plenty of batter, splatter, and gush in your horror movies Dead Snow will be right up your street. If on the other hand, you believe that the internal workings of the human body should remain forever a mystery, you might want to think twice before hiring or buying Dead Snow. You may also want to give it a miss if you do not enjoy movies that have subtitles.